Eat and Drink Your Way to Beautiful Skin! 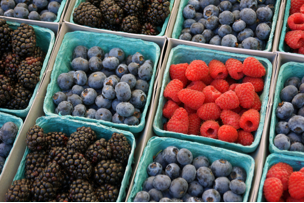 Check out these tips from Mandy Isbell for eating and drinking your way to beautiful skin. 1. Eat your organic fruits and vegetables. They are loaded with vitamin C, Vitamin E, cartenoids and flavenoids. They are natures antioxidant! My favorites include carrots, beets, avocado, pears, green leafy vegetables, and all berries. 2. Add foods that are high in omega-3 fatty acids. These can help reduce inflammation and flare- ups on the skin. Include organic chia seeds, flax seeds, sardines, fresh water salmon, walnuts. 3. Drink plenty of filtered water. This helps flush the toxins from the body which could cause issues on the surface of the skin. Drink organic green teas, 2 to 3 cups a day, which are (again!) loaded with anti oxidants. Include Kombucha drinks, which detoxify the liver. Kombuchas are rich in enzymes and acids that your body uses to destroy toxins. They help to reduce the load on your liver which in turn will help to promote beautiful healthy skin. This entry was posted in Beauty Tips and tagged beauty, skin by empoweringhealthtips. Bookmark the permalink.